Botanically known as Cheilocostus speciosus, the Crepe Ginger stands up to 3 meters tall and is a sight to behold, especially when grown en masse and flowering. The terminal stems will be beautifully adorned with inflorescences that display large, frilly and snowy-white flowers that flare out from the pinecone-like, reddish-brown bracts. This ornamental shrub has become a common and popular garden and landscape feature in the tropics and sub-tropical regions. Not surprising at all that we too have joined the bandwagon and added this gorgeous plant to our garden, two years ago. We could tell from the appearance of our plants that they weren’t at all happy being potted for one and a half years, so we replanted them in the ground last October, at a semi-shaded site. Wow… they grew by leaps and bounds and haven’t been happier ever since we relocated them! And, we’re absolutely thrilled and excited as it rewarded us with its first bloom about two weeks ago! Another interesting feature of this herbaceous Cheilocostus speciosus (formerly know as Costus speciosus) with rhizomatous growth habit is it can be propagated easily in various ways. Dig out from the ground a rhizome section with several of its stems trimmed off (you can even use the healthy stems, cut into shorter lengths to propagate new plants too). 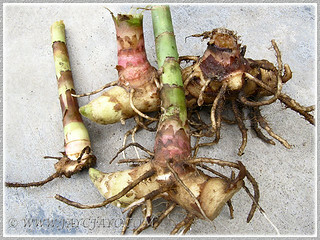 Select pieces of rhizome, preferably with at least one or two viable eye buds, usually seen at the tips or around the stem scars. Wash away the soil. Then, pot them separately in well-drained and moisture-retentive medium. Alternatively, you can plant them in the ground, 30 cm or more apart, to give it enough space to grow, as new shoots are sent up from the ground as the rhizomes creep forward. Take note that a single rhizome is able to produce many new leafy shoots that will form a wide clump easily under favourable growing conditions. Dig out the entire clump from the ground or container and divide it into smaller sections. Plant the sections separately in pots or in the ground as desired. The Crepe Ginger has the tendency to produce offsets or plantlets from the leaf nodes just below the spent flower heads or at the cut top-end of the stems. You can prune the whole set of plantlets from the stem, then snip them off separately and remove the old brown-coloured sheaths wrapping the stems if any. Then, plant them individually in pots or in the ground to raise new plants. Keep them evenly moist in a semi-shade location. 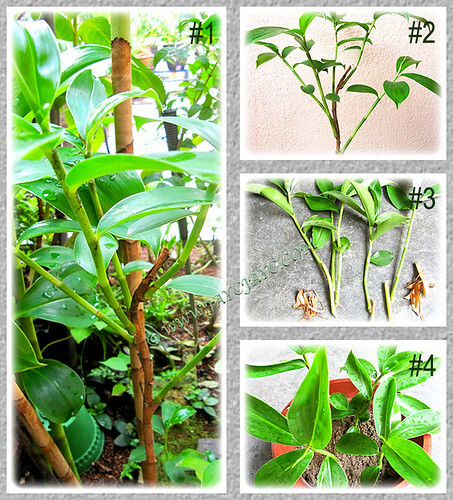 The collage below illustrates how easily this propagation method can be carried out. 1. Identify the stem that you’d want to use for propagation. 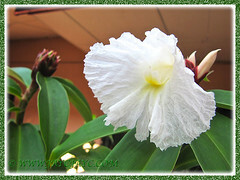 The best is a healthy and strong flowering stem, though a non-flowering one will do as well. Cut the desired stem off its rhizome with a sharp knife or cutter. Remove the paper-like, brown-coloured sheaths covering the stem, if any. 2. Then, cut the stem between leaf nodes into 15-cm sections at a slant. Ensure that there are several nodes (preferably 5 to 6 nodes) in each cut section and that the top end is marked for easy recognition when planting. 3. 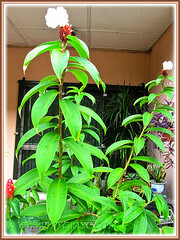 Remove any lower leaves, leaving only the uppermost leaf intact. Cutting the remaining leaf into half is encouraged to allow the stem section to focus on rooting rather than sustaining the whole leaf. 4. Then, plant the stem cuttings or sections, bottom down, in a free-draining and moisture-retentive soil, with at least three leaf nodes buried for best rooting results, as roots will develop at these nodes. Within a few weeks, new shoots will appear to start new healthy plants. Alternatively, the stem cuttings can be placed horizontally, either half-buried or fully covered with soil, to propagate new plants. Rooting hormone is not needed. Moisture, heat and humidity are essential elements to ensure successful rooting. 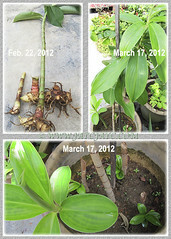 We received a fairly large clump of the Crepe Ginger from a wonderful friend in February 2012. So for starters, I just dug into the clump to cut two pieces of rhizomes with a visible eye, snipped three stem sections from a healthy stem and selected a single strong stem complete with its rhizome and foliage. 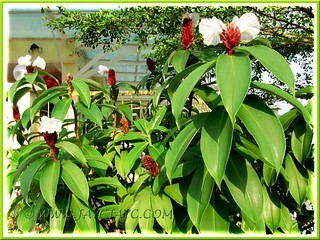 The propagation methods for Cheilocostus speciosus as shared above can be applied for Costus woodsonii (Red Button Ginger) too, another member of the Costus family. Thanks for this! I was looking for how to propagate spiral ginger from cuttings and found this, which is perfect! I just found a clump of them growing in the woods behind my apartment complex and broke off about a 1-foot piece. I buried it in the ground on its side like you said, and I’m hoping for babies soon. If I’m right, this is an orange one, because I saw an orange one planted in front of an apartment right there by that section of woods. I had about 10 notes buried, so should get at least a few plants. You’re most welcome, Amie. We love sharing our garden experiences. All the very best in your endeavour. I have a two red button gingers (potted), they both have beautiful blooms but one of them needs pruning. Not being a very good gardener person, what is the best way to prune the browner buds/flowers/cones? Thanks for your wisdom in advance! 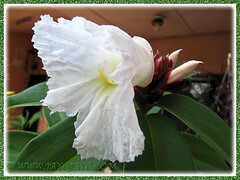 Just prune the whole stem that includes the flowers right down to soil level.